Unfortunately, unresolved armed conflicts still exist in the CIS, which stand as the main obstacle to regional cooperation and creating a common climate of trust and closer interaction between all the CIS member states, Azerbaijani Foreign Minister Elmar Mammadyarov said during his speech at a meeting of the CIS Council of Foreign Ministers on April 5, 2019, the country's Foreign Ministry told AzVision.az. 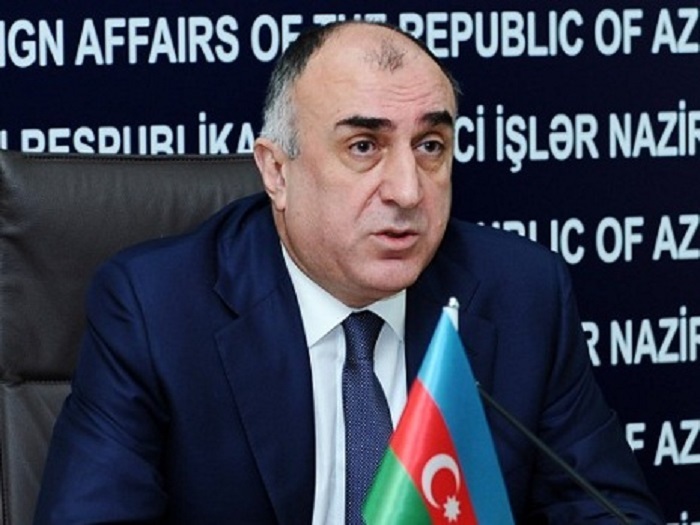 Unfortunately, unresolved armed conflicts still exist in the CIS, which stand as the main obstacle to regional cooperation and creating a common climate of trust and closer interaction between all the CIS member states, Azerbaijani Foreign Minister Elmar Mammadyarov said during his speech at a meeting of the CIS Council of Foreign Ministers on April 5, 2019, Trend reports referring to the Foreign Ministry. The minister noted that the CIS is an important platform for the all-round cooperation of the CIS member states in the discussions of and interaction on topical issues of both the regional and international agenda. In this context, Azerbaijan attaches particular importance to cooperation and dialogue in the format of the CIS. "The current agenda provides for a discussion of a wide range of issues, mainly concerning the humanitarian sphere. I believe that the continuation of cooperation in the humanitarian sphere will continue to help build confidence between our states and the development of our Commonwealth. Today’s meeting provides for the signing of the Decision “On the draft statement of the Heads of State of the Commonwealth of Independent States on the 80th anniversary of the outbreak of the Second World War" and the Decision "On the appeal of the Ministers of Foreign Affairs of the Commonwealth of Independent States on the need of preserving and properly caring for military graves and military monuments of the Great Patriotic War of 1941-1945". In connection with the 80th anniversary of the start of World War II, and especially on the eve of the 75th anniversary of the victory in the Great Patriotic War, I would like to note the great contribution of Azerbaijan in achieving victory over fascism. About 700,000 people from Azerbaijan participated in the war, 400,000 of which died on the battlefield and went missing. During the war years, Azerbaijan played a decisive role in the victory over fascism. I can say with confidence that, had there been no Azerbaijani oil and the labor of Azerbaijani oilmen, the war could have had a completely different outcome. At that time, 110 million tons of oil was produced in the Soviet Union. Of these, 75 million tons were mined by Azerbaijani oilmen," said the minister. According to him, the new realities in the international arena require effective cooperation of all states in countering terrorism, separatism, extremism, illicit arms, drugs and cybercrime in order to combat the challenges and threats to regional stability and security. “Unfortunately, unresolved armed conflicts still exist in the CIS, which stand as the main obstacle to regional cooperation and creating a common climate of trust and closer interaction between all the CIS member states. Extremism and aggressive separatism are the root cause of interstate conflicts based on territorial claims and often lead to undermining the territorial integrity of states. We presume that the earliest resolution of conflicts on the basis of sovereignty, territorial integrity and inviolability of state borders in accordance with generally accepted principles and norms of international law will undoubtedly contribute to strengthening regional and international security, social progress and economic cooperation," said Mammadyarov. The minister also added that the implementation of global energy and transport projects initiated by Azerbaijan continues to make an important contribution to the modernization of transport infrastructure not only for Azerbaijan, but also for the region as a whole. "The opening of the new Baku International Sea Trade Port complex in May of last year is the result of a successful economic policy pursued by Azerbaijan. Located at the intersection of the North-South and East-West transport corridors, the new port is already playing an important role in expanding the country's transit capabilities. The launch of the new Baku International Port created a base for forming an efficient and sustainable logistics chain ensuring the concentration of cargo flows entering the country through the corridors from the north, south, east and west in the new port complex, and for transportation via the Baku-Tbilisi-Kars railway line to Europe or via ships heading east. Along with this, reducing the level of poverty, maintaining the dynamics of economic growth and of the level of social development, strengthening macroeconomic stability, improving the investment environment, accelerating the diversification of the economy, allows Azerbaijan to pursue a successful sustainable development policy aimed at improving the welfare of the population and the economic development of the country," Mammadyarov added. The Azerbaijani Foreign Minister noted with satisfaction the signing of the Convention on the legal status of the Caspian Sea by the Caspian states on August 12, 2018. "This fundamental document creates a new legal regime that meets modern requirements and aims to further intensify the comprehensive interaction of Caspian littoral states. In this regard, I would also like to note that the first meeting of the high-level working group on the Caspian Sea, established in accordance with the convention, under which the parties began to agree on a draft agreement on the method of establishing direct lines on the Caspian Sea, was held in Baku on February 19-20 this year," the minister added. The minister said that Azerbaijan also attaches great importance to strengthening cooperation in the humanitarian sphere. "Our country has established itself as one of the international platforms for the discussion of humanitarian issues. The Baku Process, initiated by President of Azerbaijan Ilham Aliyev in 2008, celebrated its 10th anniversary last year, and the International Forum on Intercultural Dialogue held as part of this process to support joint international efforts aimed at strengthening tolerance and mutual understanding in the society. The 6th Baku International Humanitarian Forum, which has already become traditional and makes a significant contribution to the strengthening of international cultural and humanitarian cooperation, was held in Baku on October 25-26 last year. In addition, I want to emphasize that Azerbaijan hosted the VII Global Baku Forum on the topic "New World Foreign Policy" on March 14-16 this year, organized by the Nizami Ganjavi International Center under the patronage of President of Azerbaijan Ilham Aliyev. I can say with confidence that these measures are the result of the recognition of the efforts of Azerbaijan in promoting the values of intercultural dialogue,” the Azerbaijani Foreign Minister concluded.